At Wing Solar & Wood Energy, Inc. we want you to have complete confidence in your solar system and in the service you are receiving with us. Below you will find some of the most common questions we answer on a daily basis. If we can assist you in any way, please feel free to contact us at 1-800-492-4061. Actually, the word photovoltaics defines itself. Photovoltaics has two parts: photo, which means light, and volt which means electricity. So, photovoltaics translates into light-electricity. A PV system is made up of numerous components. Including PV modules or panels and one or more batteries; a charge, an inverter and mounting hardware or a framework. A solar system that is designed, installed, and maintained by our experts at Wing Solar & Wood Energy, Inc. can save you valuable dollars for over 20 years. Can I use a solar system to power my home? Solar systems are specifically designed to power your entire home's electrical system, including lights, cooling systems and appliances. Solar systems can also be implemented into both traditional and nontraditional homes. Solar systems are typically mounted onto a south-facing roof or wall. Can I use a solar system in my office? Absolutely! Solar systems can be used anywhere, including, outdoors for security lighting and covers for parking lots, bus shelters, etc. A solar system must have clear access to the sun's rays for most of the day. Shading on the system can significantly reduce energy output. The good news is that there is enough sunlight to make solar energy systems effective nearly anywhere in California. How big of a solar energy system do I need? The size of your solar system depends on several factors that include how much electricity, hot water or space heat you use, what the size of your roof is and how much you are willing to invest. In addition, do you want your solar system to be your sole energy source or is your system a supplement? 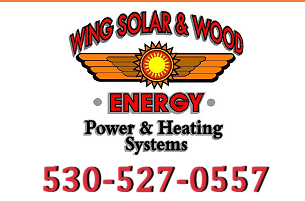 Our experts at Wing Solar & Wood Energy, Inc. will schedule a consultation and provide you with a package best suited to your needs. Just give us a call today. Net metering is a policy that allows homeowners to receive the full retail value for the electricity that their solar energy system produces. This means that any excess electricity will be offset on their electric bill. Not completely. Conventional water heating systems are necessary as a supplement because the sun may not shine in a particular area for several days at a time. However, because solar water heaters are designed to provide hot water directly to the tank, they reduce the need for the water heater to run on conventional fuels. This means, you can reduce your gas or electric bill. Depending on where you live, your solar water heater can provide up to 80% of your home's water-heating needs.